Kusunoki Masatsura - Fantastic depiction of the great warrior Kusunoki Masatsura making his last stand at the Battle of Shijonawate in 1348. 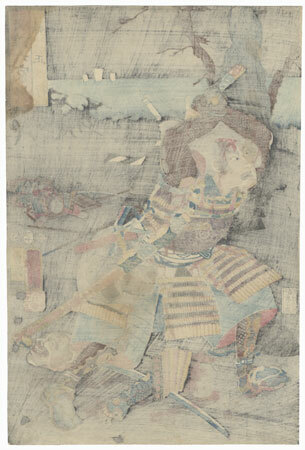 Masatsura was a supporter of the Southern Emperor Go-Daigo during the 14th century Nanbokucho Wars against the Northern Empire established by the Ashikaga. 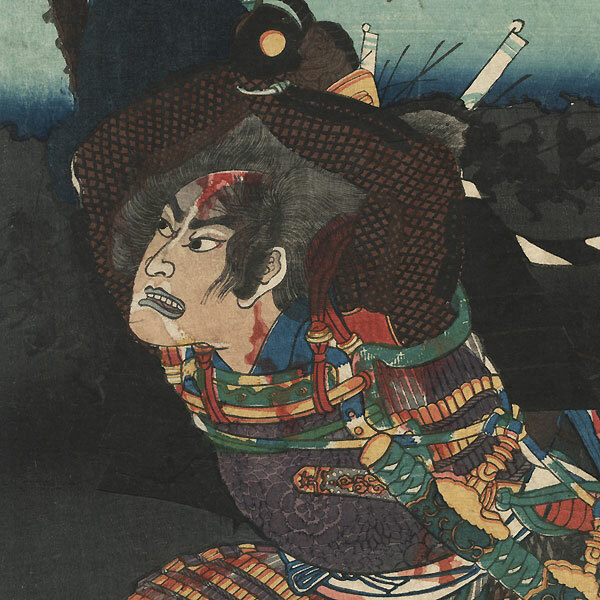 Kusunoki charges forward gripping his sword with both hands above his head, bleeding from wounds to the head, neck, and body. His face is gray and his lips are gray, a sign of his impending death. A net bag at his waist holds the severed heads of several enemies, and another lies on the ground below, along with a severed arm. The fighting continues on the shore of the bay behind him, with figures silhouetted in black. The stone statue of a deity appears in blue-gray at upper left. 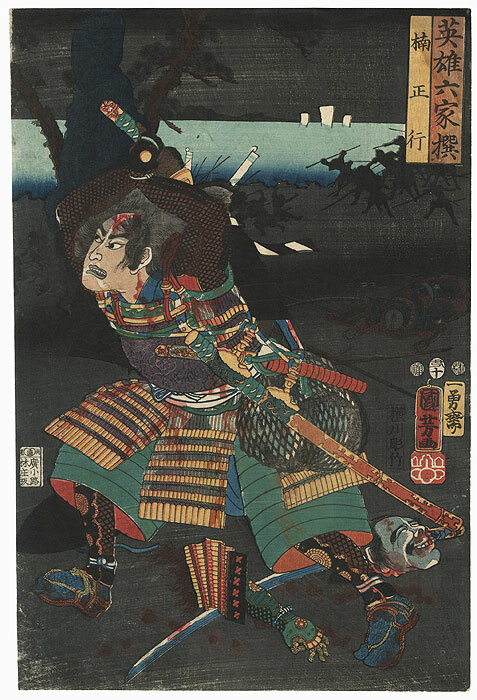 A memorable image of this fearless samurai with a dramatic night setting. Image Size - 14 1/2" x 9 5/8"
Condition - This print with excellent color and detail as shown. Stitching holes at side, small hole, repaired. Slight toning, a few creases and slight rubbing at edges. Please see photos for details. Good overall.